Every now and again, I feel the urge to pull out an old favorite and mix it up again. That was the case the day I made this CD clock. 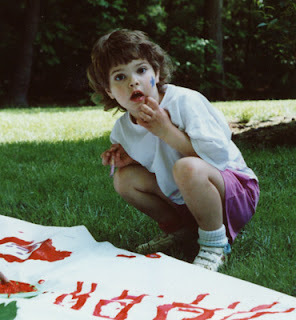 My daughter and I made quite a few of them when she was still in high school. It was a quick and easy project that we could bang out fast, and the clocks made dynamite handmade gifts! 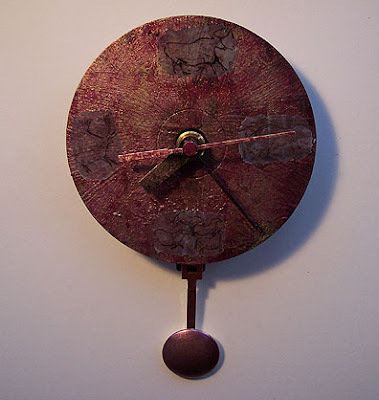 I started by buying a pre-made clock works with a swinging pendulum. This one was ready to hang on the wall just as is. The other main thing you will need is an old CD. I used one of the vast collection of AOL CDs that I still have hanging around the studio. One down, 99 more to go! 1. Sponge gesso all over the front of the CD. Dry thoroughly, and use additional coats of gesso until it’s completely covered. 2. Sponge on the acrylic paints of your choice. I listed mine, but experiment with your own color scheme. Paint the clock hands and the pendulum to match. 3. Print out images that you’d like to use on your clock. I printed out cave painting images onto vellum so that the background would merge somewhat with the clock face. You can use any images that suit you. Use a bit of acrylic medium or glue to adhere them in place. 4. 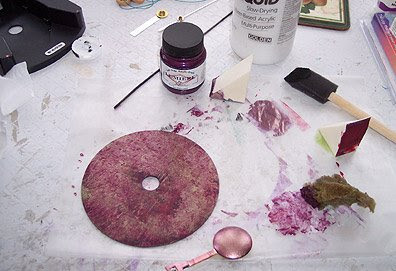 Give the whole clock face a sealing coat of acrylic medium. 5. 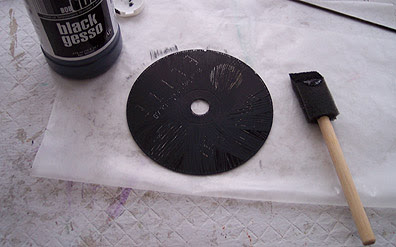 When the paint is thoroughly dry, attach the clock works through the CD hole. Adhere the CD to the plastic case of the works if the hole is too big. Sometimes you’ll find that the hands of the works are too long - just snip them off to the right length. 6. When the glue has completely dried, insert a battery and hang your clock.